For the past 5 years Custom Cutters Tree Specialists have been carrying out additional services at the request of our regular client base. Robin Byles who owns and closely manages the company, has an established and committed team of employees who specialise in each of the different areas allowing Custom Cutters to provide a professional service from start to finish. Hard Landscaping works are carried out under the close supervision of Wayne Byles who has worked for the company for over 10 years. Starting his career in the construction industry, Wayne has a strong understanding of construction techniques and a good eye for detail. His work is carried out with care and diligence and he project manages all constructions from site. 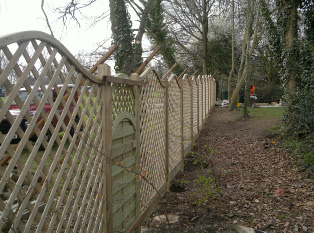 We construct a wide variety of fences to the highest standard. Our bespoke service includes an initial consultation offering advice on the different types of fences and trellis available and suitable for each individual site. The construction of the appropriate and desired fencing is then carried out to the highest standard with a professional approach. 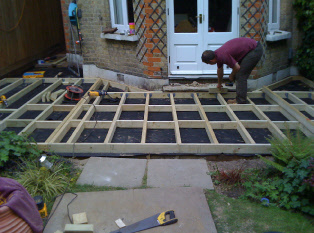 We install decking which is individual to each garden. A wide variety of timbers are available which suit different properties and garden landscapes. Constructed to a high standard and treated following construction our decking areas will provide your garden with and extension to the house from which the garden can be admired.